1000's of man-hours & 240 million paper bags to bring you quality grapes! The Hondon Valley and its surrounding areas are well known for their reliance on the grape growing industry. Both table and wine grapes are grown here and have been for decades. Many generations of farming families make their living growing grapes (and almonds) in the Hondon Valley. The main table grape	varieties are Aledo, Italia (aka Ideal) and Rosetti. But grapes are a delicate fruit and need a lot of care and attention. When you visit the area during the growing season you will see acres of vines and you can't fail to notice that a large percentage of dangling grapes on the vine are covered in white paper bags! And you ask yourself why? Bagging of Vinalopó grapes on the vine is traditionally done during late spring / early summer. About 10,000 workers across the valley and beyond painstakingly tie white paper bags to each fledgling bunch of grapes... row after row after row. This is a directive and controlled by the RCDO. 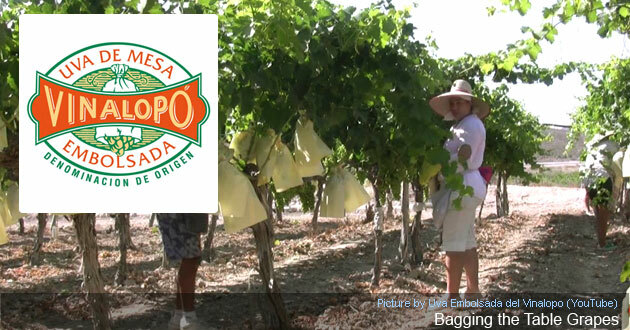 The bags are necessary for and help in the protection of the ultimate grape harvest. The farmers want the best yield possible after all. These protective paper bags prevent pest infestations, feeding birds and shield the grapes from direct pesticide sprays and the fierce sunlight here. The locals insist this adds to the flavour, colour and texture of the grape, makes the skin is thinner and easier to eat, plus fortifies the vitamin and nutritional qualities of the fruit. According to the RCDO: the Grape Vinalopó has anti carcinogenic qualities given its high content of "resveratrol", a substance capable of preventing the development of tumours. A recent Madrid University study says the local grape has "a potent anti-cancer component, whose presence in the skin of grapes has been proven effective in preventing cancer and slow its progression when it has appeared." We all know we should eat more fruit and vegetables. The consumption of local grapes can help lower cholesterol levels and thus prevent cardiovascular disease. Of course Hondon grapes are very tasty, sold across the land and exported too. They are best eating around late Sept/Oct but still harvested up until Christmas and New Year. Because they are abundant here the price per kilo is very low (typically a € per kilo), about a third of the price to UK. About the bags: The summer sun warms the earth and the vine life begins. The fruit begins to slowly mature acquiring the characteristics that make the bagged grapes DO Vinalopó of exceptional product. Bagging grapes, which usually lasts for about two months, is a manual process. It helps make for the unique quality of these grapes. Paper bags are made from virgin pulp and designed to protect each cluster. This will contribute some of the grapes taste, appearance and advantages such as delaying the maturation, softening the skin and firming the flesh. The paper bags also help in uniform ripening of the fruit reach, thanks to the reflection of the sun's rays through the semi-transparent paper. The grape acquires the golden hue and intense flavor so appreciated by consumers. The grape bunch will remain protected from dust, water and weather conditions and so they remain healthy thanks to the protection of the paper bag so they come to the market in optimal condition. The grapes are harvested from September to January. The production of grapes in the Vinalopó locality focuses on locations in Alicante, Agost, Aspe, Hondon de los Frailes, Hondon de las Nieves, La Romana, Monforte del Cid and Novelda. ENJOY THEM!